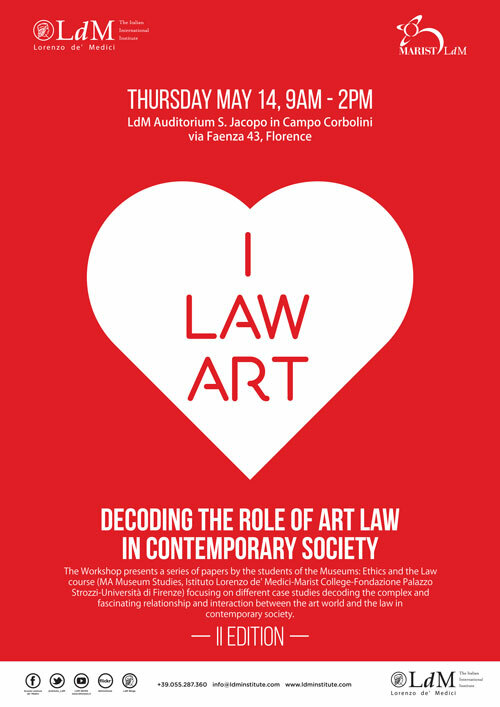 Where there is Art, there is the Law and on Thursday, May 14 2015 the both of them come together during I LAW ART: a conference workshop by the students of our M.A. Museum Studies class “Museums: Ethics & The Law”. Students will be presenting a series of papers that focus on different case studies decoding the complex and fascinating relationship and interaction between the art world and the law in contemporary society. The workshop wanders through the legal history of the works of art and museum legislation, using a sociological and critical approach, in order to analyze the implications of International Law and jurisprudence for the protection of works of art, as well as for the development of artists’ rights in modern complex society. Thursday, May 14: Florence, LdM Auditorium, via Faenza 43 | from 9am to 2pm.